The drug, buprenorphine-naloxone, cannot be prescribed without a waiver from the federal Drug Enforcement Administration (DEA). Researchers from the University of Washington School of Medicine found that, as of 2012, only 2.2 percent of U.S. physicians had obtained the waiver and, notably, 90% of those physicians practiced in urban counties. 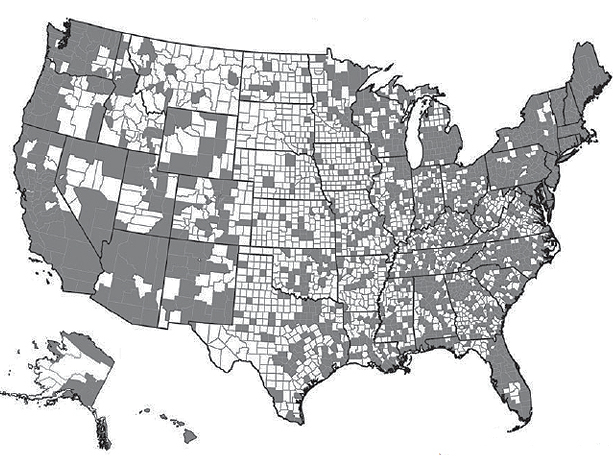 Thus, 53% of U.S. counties, most of them rural, have no physician licensed to dispense buprenorphine. The study was published today in the Annals of Family Medicine. The study was spearheaded by Dr. Roger Rosenblatt, a longtime UW advocate for improved rural healthcare. He died in December 2014. Opioid use and related unintentional lethal overdoses have grown substantially in the past decade in the United States – with rural areas disproportionately affected, according to a 2013 report by the Centers for Disease Control and Prevention. Among all causes of death between 1990 and 2010, drug use has accounted for the greatest increase in deaths and years of life lost, research shows. Deaths resulting from prescription and illicit opioids exceeded the the number of people who died in car accidents during that span. Before the year 2000, the use of opioids to treat opioid addiction could only take place in federally approved treatment programs. The Drug Addiction Treatment Act of 2000 was intended to expand that treatment to qualified providers nationwide. The study was led by longtime UW physician and teacher Roger Rosenblatt, who died in December. For 40 years he championed the effort to improve rural healthcare in the Pacific Northwest. "This is a fitting final piece of work for him," said Holly Andrilla, a corresponding author of the study and a biostatician with UW's Rural Health Research Center. "Roger worked in rural places and was passionate about rural health. He did a lot in terms of getting providers trained and building support for rural clinicians. It was really important to him to finish this work before he died," she said, "but we all wish he was still here." The findings present a stark regional distribution of physicians who can prescribe buprenorphine. Physicians with waivers are concentrated on the east and west coasts. Huge areas in the middle of the nation lack easy access to caregivers who may prescribe the drug, and residents of these counties must travel long distances for outpatient buprenorphine treatment. As well, no information indicates whether the physicians who have obtained the waiver actually have adopted the buprehorphine therapy into their practices. Multiple barriers exist to the office-based treatment of patients with opioid use disorder, which might dissuade physicians from adopting buprenorphine as a treatment option, the researchers wrote. They also noted a lack of lack of institutional support, inadequate resources of nursing and office staff, payment issues and the lack of mental-health specialists. Media: To interview UW specialists in opioid-use disorder, please contact Brian Donohue at 206.543.7856 or via email.